Hi there and welcome to my website dedicated to the Fiats I own and/or have restored, modded and just have had fun with. My love affair with Fiats dates back to the late 80’s, when I came across a midnight blue 1979 Fiat Spider 2000. The Fiat Spider, AKA the 124 (Fiat often used the internal “code” for name as part of it’s production cars) was built and sold from 1966 to 1982 (then later built and imported by PininFarina until 86?). Interesting fact; the engine was designed from day one by former Ferrari engine designer Aurelio Lampredi. There was also a Coupe version that shared the same drive train and nearly all of the suspension bits. Another interesting fact; the 124 was one of the earliest mass produced cars that had 4 wheel disc brakes (1966? You believe that??) and a DOHC engine configuration, driven by a cam belt. There are TONS of other cool facts about this car, but rather than plagiarize wikipedia, please have a read for yourself. I absolutely LOVED this car. The next Italian object of my desire was red 1974 split bumper 124 spider. I recall a friend of mine bought the car just for the rims for his restored Fiat 2000 spider. I am was happy to take the care off his hands on the cheap. Next was my first Fiat sedan, a 1978 yellow 4 door Fiat 131 supermirifori. The 131 was the Fiat’s successor to the Fiat 124 Abarth rally car FYI. My 131 boasted an 1800cc DOHC engine. Same basic engine/trans as the 124 models. I liked the fact the 131 could carry 4 people! The next one was a HIGHLY modified 1979 Fiat x19. Dual webber DCNF carbs, performance exhaust, header, custom coil-over struts, front and rear adco anti roll and sway bar(s). I did the restore on this one too, focusing on converting the nasty brown interior into a black leather and vinyl with a 1974 perfect condition seats. A non stock shade of russo (red). Final touch was a set of replica built Abarth cd30 mags. The single most expensive part and work done to that car. In the end, I sort of disliked the rims. Car went to a friend and fellow Fiat America member just before I had to move out of state for a job. During the same time I owned the 79 and before I restored it, I came across a low mile PERFECT condition 1986 two tone FI X19. This was a major step up to a “modern” car as I felt at the time. The year was 1994 so this made the 86 less than 10 years old, so for me it was a major step up. The car had a full leather interior, AC and power windows. Problem was this car was too perfect for me and I constantly worried about it getting a scratch or something so I sold it. It was then that I restored the 79. Also at the same time, i came across a 1970 yellow Fiat 124 spider. Got it for nearly nothing ($50.00 I believe) so it was a no brainer. Needed a battery and I drove it home. However, the car had more issues than I had time for and consider I had 2 other Fiat’s, I needed to slow things down and pull back a little. So I let the car go cheap. The date now was 2001 and I found myself moving out of state for a job – clear across country from SF to Washington DC actually. So I sold all the Fiats and Fiat stuff I had and split. I thought my days with Fiat’s was over. I actually felt certain of it…Until I happened to move back to California in 2008. 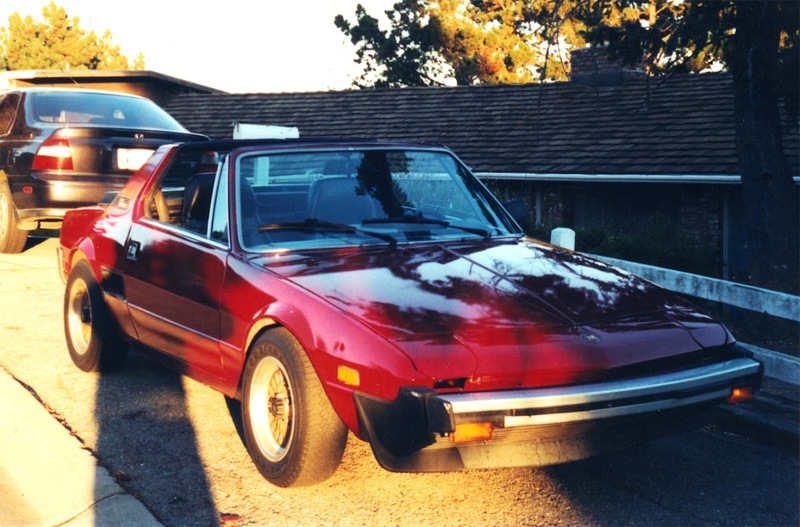 Seemed as soon as I got back to SF/Bay Area, a Fiat x19 found me. A 1986 in fact. It was a non runner down in San Diego, about 500 miles from me. I flew down, got it running and after a visit with family in the area, I drove it home. The car also needed a restore (paint was all really) so I did some body work and had a on the cheap Corvette Red paint shot on it. Car was great until someone decided to smash it while parked near my daughter’s school. It was totaled. Now living in California makes it hard to own and drive modern classic cars. Mainly due to the smog restrictions put on the cars. However IF you were lucky enough to get your hands on a 75 or earlier car, you are exempt from the requirement of getting a smog check ever. As such, 75 and earlier Fiats (or all cars people want to restore). I was lucky then to have found a 1975 X19 being sold in Oregon. I took a flight up and brought the car home on a trailer (12 hours later). I bet you think that was it huh? Well, no it wasn’t. Because, in 2009-ish, Fiat came to the rescue of Chrysler and bought a large chunk of the companies assets. This of course opened the door for Fiat to begin to sell NEW fiats in the US. This was great timing due to the fact that Fiat had just started selling the new Fiat 500 a short while before all over the world – US was pending. It wasn’t long until the Italians were back; 2011 the 500 appeared on our shores. Well, I think at our borders is more like it as the majority of the car was manufactured both here in the states and Mexico. No part of the car was actually imported from Italy. I had a daily driver that was starting to show its age and strand me from time to time so I was happy to buy a NEW Fiat. I in 2012 I ended up buying a “Verde Oliva” (poop green as my daughter called it) Fiat 500 pop. A 5 speed base model really. It did have the “sport” button. I think it increased the G forces about a 0.00001? Who knows. It was cool though. It did GREAT on mileage that was for sure. I was averaging about 39-40MPG pretty much every time I did trip anywhere. I was heading north of 15k miles in my first year of owning the car. I was pretty happy with the car. Color *slowly* grew on me. My daughter LOVED the car. To own a real Abarth?? This was my dream I have had since I first discovered Fiats! I was pretty excited. I found a 2013 on the lot with full leather, sunroof and the other cool stuff. I modded it with an ECU piggyback to add some power and torque and a programmable throttle (better response,etc.,). Lots of fun. Now we had 2 500’s and an X19. Perfect family. My daughter pointed out once we had the colors of the Italian flag now too. Then in 2014, Fiat starting selling the 500L. The biggest issue with the green 500 was lack of space. I saw the L and really liked it so I traded the Verde Oliva in for a dark grey Trekking model. There is a LOT of debate on this car. Some love it, many hate it. Looks-wise; its *ok*. Nothing special. From nearly every angle, I like it. Although the rear of the car is sort of “meh”. Our car also has the glass roof with retractable top (sunroof). It’s pretty amazing actually when you are driving down the road and the entire inside of the car is lit with sunlight. pretty neat. Also makes star gazing fun too (albeit the roof glass is tinted). Interior is very roomy, great sound system and nav. 6 speed isn’t bad either – driving a 1.4 liter turbo at 80 MPH while staying under 2600 RPM is pretty amazing! However, the model was not vetted fully before they made it available to the masses, IMO. The car soon showed signs of issues with the steering (electric assisted), some cosmetic problems, etc., I tried to defend it, but I am in agreement with most folks these days and that this was not a good choice. Fiat later released the 500X (the car I wanted to wait for and I should have looking back). The X is what the L should have been; a 4 door, optional AWD, optional 1.4 turbo and a 2.4 9 speed auto. So HP choices from 160 to 180. The design is far more similar to the original 500 but big enough to carry 4 + stuff no problem.